The Come Follow Me chapters for the next two weeks cover Matthew 16-17, Mark 9, and Luke 9. Since we have two weeks to cover these chapters I decided we are going to use this week to learn about testimonies. 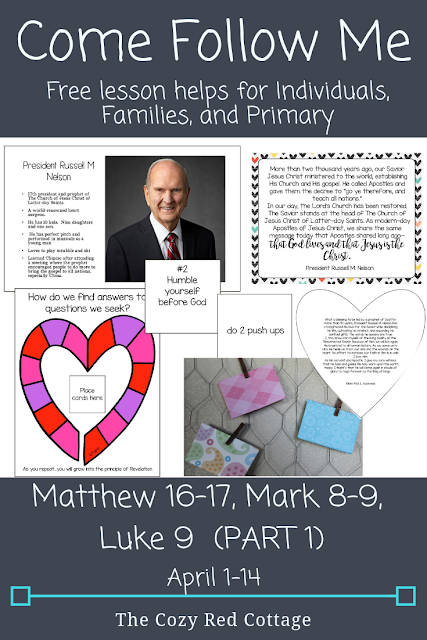 We are going to focus on how we gain a testimony, cover Matthew 16:13-17 (Peter's Testimony), and prepare for General Conference by getting to know a little more about the prophet and apostles and reading their testimonies of the Savior. The first activity can be done two ways. You can do it in one night OR you can do one or two a day and use it as more of a count down to General Conference. Before I explain how we are going to do this activity here's a quick run through on what's included in the download for this activity. Get to know you cards for the prophet and apostles. Each card has their picture and some fun facts about them (pictures and facts found on lds.org). Print preferably on cardstock. If you want to save some ink you can find a power point version in this post. Easy to pull up on your computer each day. I've updated the file and there is a fun fishing game you can use as well or instead of the activity below. 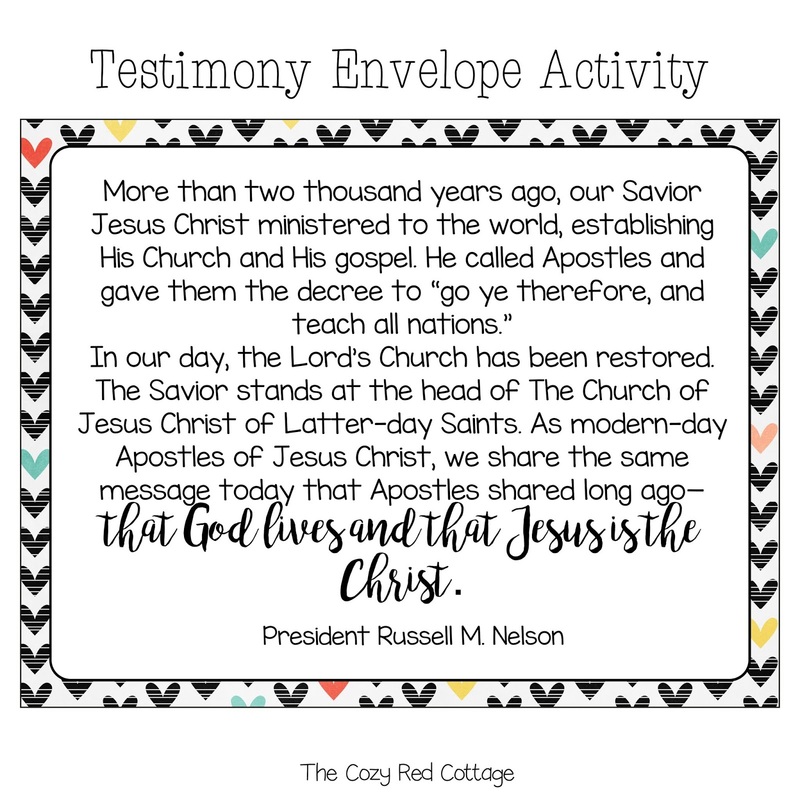 Testimonies of the prophet and apostles. I was so excited to find this article. 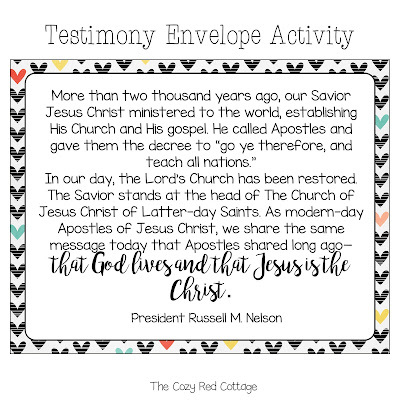 When they were in Rome for the temple dedication they shared excerpts from the Living Christ (I plan to show the video clip ) and their personal witness of Jesus Christ. I put these on individual hearts. They can be printed and left as is or print on the back of patterned or colored paper and fold into mini envelopes. (you can find a tutorial here). You can place these in a basket, clip to a ribbon, tape them to the wall, or keep in a pile to pull out as needed. I need to finish cutting mine out but here's how I'm displaying my envelopes for the week. The 3rd part of this activity is the this quote page. There is a black and white option. To set up this activity read and display the quote below. Each day pick a couple of hearts. Read the testimony on the heart and find the matching person. Read the fun facts about that person. Display the heart and the fact card under the quote. Add the hearts and fact cards through out the week. I hope to have all of them displayed before conference starts. 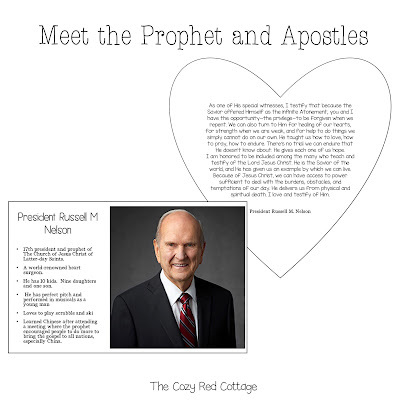 This will be a fun reference to help your kids recognize the prophet and apostles as they speak. After conference I plan to hole punch the top corner and add a book ring to create a mini book for our church bag. I did laminate mine. 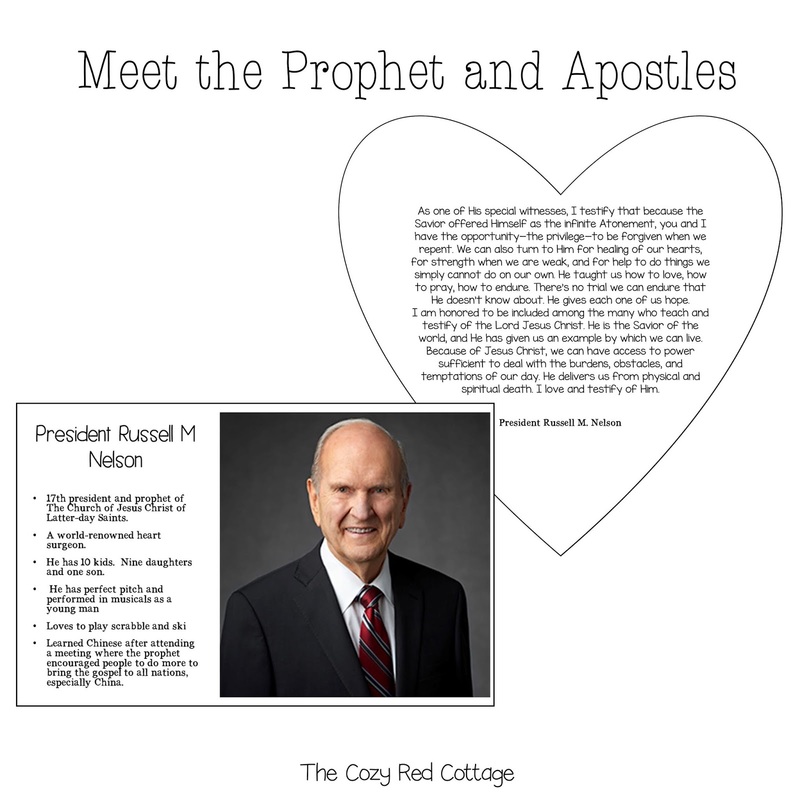 I like to spend some time introducing my children to the apostles and prophet before each conference because I've noticed if they recognize the person talking to them they are more likely to stop and listen. They are little and sometimes they only stop for a couple of minutes but during those few minutes they hear the message of the gospel and have the opportunity to feel the spirit. This is how they develop their own testimonies of the Savior and the gospel. The second activity for this week will be our FHE night. We are going to talk about gaining a testimony and how to find answers to our questions. 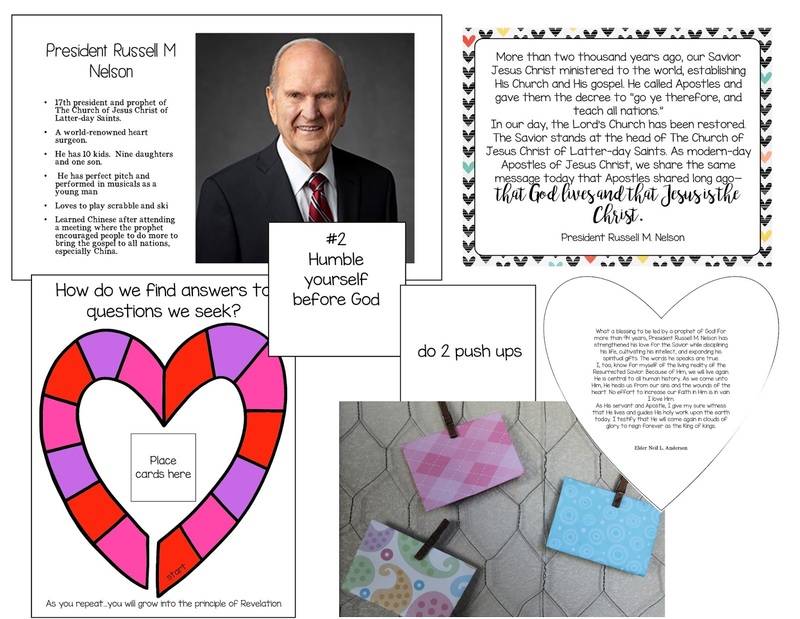 To do this we are going to use steps President Nelson shared in his talk from last April's General Conference. We did this fhe last year and I included the outline I used. I am following it pretty close when we do it this week. 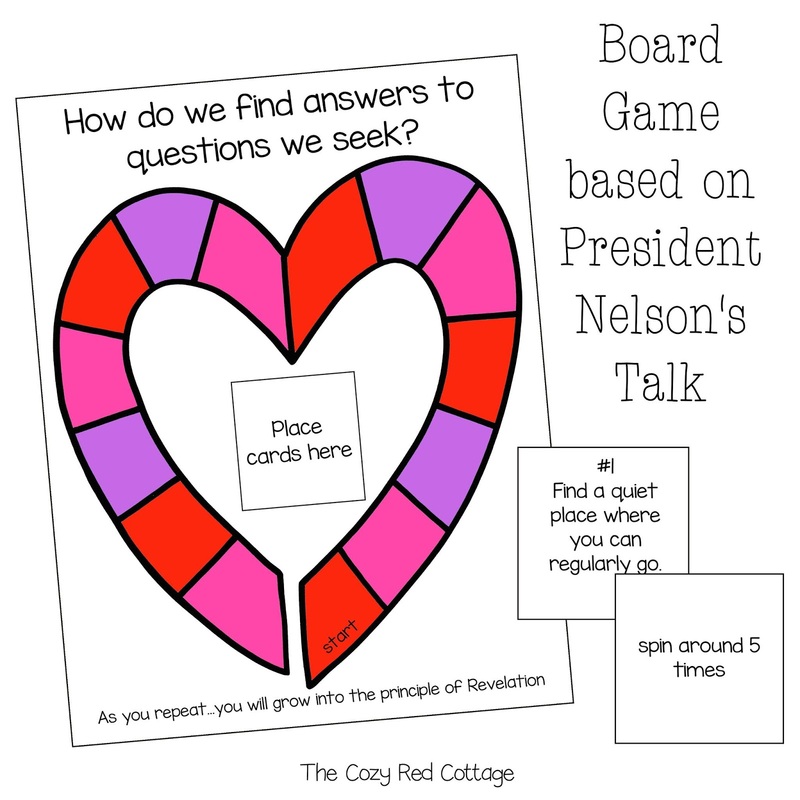 I did change the game to a board game which is included in this post. To play print the board and page of cards. cut the cards apart and mix them up. Place on the cards spot. On your turn roll a dice and move the correct number of spaces. Pick a card and do what it says. Most are fun active movements. There are 7 cards that are numbered and correspond with the steps in President Nelson's talk. Set these aside and the player moves forward one extra space. The goal is to find all 7 steps before every player reaches the end. If you run out of cards mix the movement cards up and use again. In the original fhe post you will find the puppets I reference to in the outline and it has a life size version of this game instead of the board game. Its played a little differently but has a lot of the same elements. That's my plan for this week. Early next week I'll be back with some updated Conference activities and a new game. Next Friday I will post the 2nd half of this lesson covering much more of the assigned chapters and topics . As always if you have any questions, find any mistakes, or have trouble downloading something please don't hesitate to let me know. Thank you, Thank you! I appreciate you sharing your talents and clever ideas, you have become a wonderful resource for me as I teach my 5 year old CTR class. Thanks for all the hours you spend putting lessons together for us and sharing freely...they're wonderful! Thank you so much :) I'm happy to help! You have become my first go to place when planning for my ctr 4 class. I love your ideas and they are easy to simplify for them to understand. I always look for one activity for them and you usually have it. Thanks so much for your effort. Love love love! Thank you so very much! You always share the best ideas. Thank you!